If you're looking for Craftsman Style House plans, I wrote this page to help you decide whether or not this house plan style is right for you. So to set the scene we’ll go over some of the common features of the Craftsman Style, then we’ll go on to discuss factors to consider if you’re thinking about going for this style. Shape based on rectangles with large use of rectangular bays to create an interesting exterior shape. Low pitched roofs with overhanging eaves supported by knee braces. Porches with thick tapered columns. Windows often featuring divided window lights. Height can range from 1 to 3 stories. Is a Craftsman style house plan suitable for your home? Flexibility – The hallmarks of craftsman style house plans are more to do with the detail of the house such as the window lights and column shapes than the overall shape or height of the house. This makes the Craftsman style very flexible since as long as the plan includes the craftsman design elements, it’s possible to stay true to the Craftsman style with more or less any floor plan. Lot Shape – As this style is flexible (see above) it means it’s suitable for many lot shapes. I think it especially lends itself to suburban lots which can be on the narrow side. Sloping Site – The craftsman style home would be suitable for a sloping lot condition. In fact elements such as the large porch and balconies would draw the eye away from the fact that there was a slope. Scalability – This style suits any size of home with typical plans on the market ranging from 1,200 to 3,500 sqft. There are a huge range of house plans available in all shapes and sizes from simple economical bungalows to mansions. Whether a home is 1, 2, 3 or even 4 stories it can wear a craftsman style well. It’s important to think about the proportions as the home gets larger though. The craftsman style has the most impact when the front elevation is roughly square. It starts to lose it’s impact on a wide one level home. If you’re looking for long wide homes the Prairie Style or country style is worth looking at. Expansion Potential – Because of the flexibility there is lots of expansion potential with Craftsman style homes. The roof space is usually made more liveable with the use of dormer windows so this means that converting the roof space will involve putting in a dormer as well as finishing off the space. There is good potential for additions because the shape of this style is very flexible. Cost of Construction – So the cost of all this flexibility and the design elements is that craftsman homes are more expensive to build. The more corners (which means more walls and more roofs) the more expensive. The windows will also cost more than plain windows. In England in the 1860s William Morris and John Ruskin were not happy, not happy at all with all the Victorian style frippery and the ideas of the Industrial Revolution that machines can do everything better. They launched the British Arts and Crafts movement in protest to shout about the value of everything hand-crafted. Now the people of America know when to cut their ties with England but aren’t afraid to jump on the bandwagon of a good idea when one comes along. The Arts and Crafts movement was adopted in the United States as the ‘American Craftsman’ style. A style which was to last through to the 1930s. The style suited what was going on in the United States at the time. There were changes in the way people were living as the middle class was on the up. Gone were the Victorian days of architects designing homes for families supported by servants where the kitchen would be placed separately from the main living rooms. Now the lady of the house found herself preparing meals and looking after the children. (Could I have the odd 5 minutes of being a Victorian lady of the house please?). This led to the concepts of more open plan living with an eating area being included in the kitchen. Built-in cabinets became all the rage to store all the stuff, like the dinner service (that would previously been carried around by the servants) in the appropriate place. The ideas behind the movement such as simple forms, the use of natural materials and making things beautiful with handcrafted details struck a chord. After all who wouldn’t want to create something beautiful and original? Often the architect would design the house itself and everything in it, ceiling details, cabinets, fireplaces and even furniture. The residential architecture firm that stands out the most for the Craftsman style is in fact a duo of brothers, Greene & Greene. They combined British Arts and Crafts ideas with Japanese style. 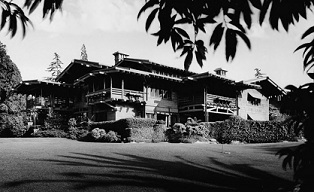 The Gamble House website is well worth a visit. This House style got the name ‘Craftsman’ from a magazine founded in 1901 which featured designs by Greene & Greene among others.